Co-developing the CSR Policy and initiative, that integrates the Company's goals and socially sustainable solutions. Identify a thorough Project plan and the implementation schedule to institutionalize efficient and sustainable management system. 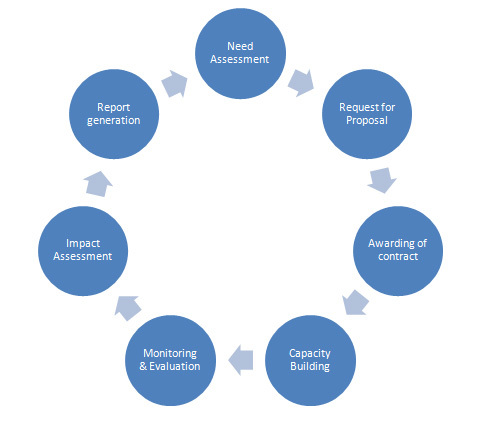 The progress of a project in achieving its goals shall be captured in defined reporting structure. Conduct of annual Social Audits for Corporates that projects the holistic progress of the initiatives undertaken. Providing an opportunity to work on community development projects planned by Corporates as their CSR initiatives. Conduct of satisfactory, systematic and impartial assessment of credentials, capacity and track record of CSOs. Encourages maximum potential and minimizes risks of every grant as well as assess the need areas of every CSO for making it a more effective, and successful collaboration. Enhancing the knowledge of the stakeholder and beneficiaries in domains related to Corporate Social Responsibility, Program Management and Reporting. Develop a comprehensive system to monitor the progress of the project and measure the achievement of goals, on an ongoing basis. To assist the Corporate in identifying the gap between the existing conditions and the desired conditions, FICCI SEDF offers its services to conduct the need assessment for catering to the felt need. To enable the workforce to be equipped with desired knowledge and skills, FICCI SEDF offers training modules regarding the CSR policies, its designing, execution & evaluation. A detailed mechanism to monitor the progress of a project enables in managing last minute contingencies as well as identifies ways to improve upon the existing plan. FICCI SEDF facilitates in setting up frameworks and mechanisms to track the progress of the project. In the age of heightened communications, it is imperative to share the progress made in the project during the year. FICCI SEDF facilitates Corporates in generating Annual reports on their experience and progress in the social domain. To understand and measure the project's impact on the targeted beneficiaries, FICCI SEDF offers services to conduct the impact assessment to develop the program to cater to the deficiencies identified.